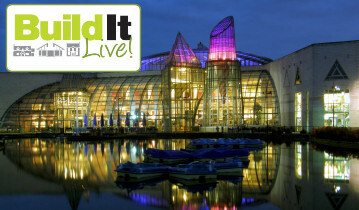 This year we exhibited our brand new Emperor Concealed Bifold Doors at Build It Live at the Glow events venue at Bluewater in Kent. The event ran from the 28th February to the 1st March. This was our first time at Build It Live, and we only went along as part of the product launch of these fantastic new doors. However we are very glad we did for a relatively small show it was hugely busy and the buzz and energy and excitement around the show was equal to that of Grand Designs Live when it first started. We almost ran out of brochures on the first day and had to go back the the main office for more. The Emperor Concealed Bifolding Door was very well received and generated a lot of potential leads for our customers in the South East. This may well be a show to look out for in the future.